Leonard Slatkin is doing good things in Detroit, and his ongoing Copland cycle is ample proof of that. Since he became music director of the DSO in 2008, he’s recorded four Copland albums, of which this pairing of Grohg and Billy the Kid is the latest. So, in order of release: Rodeo, Dance Panels, El Salón México and Danzón Cubano, much admired by John Whitmore; a fine coupling of Hear Ye! Hear Ye! and Appalachian Spring (a Recording of the Month); and, most recently, a ‘heady, hyper-bold’ account of the Third Symphony (original version). I found the initial volume, which I’ve not reviewed, slightly disappointing. Then again, it’s the earliest recording of the lot (2012), and competition in those works is very fierce. That leads me, rather neatly, to rival accounts of Grohg and Billy the Kid. Up until now, there’s only been one available version of the former, with Oliver Knussen and the Cleveland Orchestra; that premiere recording, first released on Argo 443 2032, has since been reissued on a Decca Double, along with other Copland pieces conducted by David Zinman and Antal Doráti (478 4585). I have several recordings of Billy, but I’d take just one to my desert island: it’s from Andrew Litton and the Colorado Symphony (BIS). Not only is that a musical tour de force - ditto the accompanying Rodeo - it’s also a sonic sensation. (You guessed it, another Recording of the Month.) Which is a good time to point out that the Naxos sound, once fair to middling, has improved a great deal in recent years. Indeed, the presence of Soundmirror’s Blanton Alspaugh in this Copland project is a sure sign that the label’s technical priorities have changed. In 1922, Copland’s teacher in Paris, the legendary Nadia Boulanger, suggested it was time he embarked on his first orchestral work. As Charles Greenwell points out in his succinct liner-notes, the composer went with a friend to see F. W. Murnau’s silent classic, Nosferatu, which gave him the idea for a ballet provisionally titled Le Necromancien (The Necromancer). The final work, now called Grohg, was completed in 1925, revised in 1932, and subsequently withdrawn. It was only after Copland’s death in 1990 that Knussen discovered the score and premiered it with the London Sinfonietta in 1992. The Cleveland recording followed a year later. 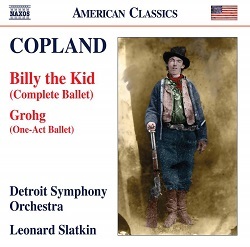 This was a significant find, for Grohg is a striking piece that really ought be as well known as Copland’s more famous ‘frontier ballets’, Rodeo, Billy the Kid and Appalachian Spring. Indeed, such are the levels of confidence and creative energy on display here that it’s hard to believe this was only the composer’s first orchestral outing. And while it draws on a narrative rooted in the old world, the underlying feel of the music surely speaks of the new one. That’s clear in the first bars, where Copland’s musical ‘signature’, so familiar from his later works, is already discernible. Also evident from the outset is that Slatkin’s reading is more immediate, more visceral, than Knussen’s. That’s helped by a broad, deep soundstage and playing of great conviction and character. By contrast, John Dunkerley’s Cleveland recording, made in the airy acoustic of Severance Hall, is more refined, the British conductor less willing to ‘let rip’ than his American counterpart seems to be. Of course, there’s more to this music than that. The quieter moments are just as impressive, the gorgeous woodwinds as liquid as one could wish. Otherwise, Slatkin’s phrasing and rhythmic control - in the orgiastic adolescent’s and opium-eater’s dances, for instance - are a joy to hear. And how gripping the overall narrative, with its nods to the strange, flickering world of German Expressionist cinema and the motoric aspects of Stravinsky’s early ballets. Then we’re thrown off balance by a winsome piano part that steals into the lurid insouciance of the street-walker’s dance. Bravura writing and playing, this, and magnificently recorded. I’m tempted to invest in the high-res download, but then this vanilla 16-bit version sounds so good I probably won’t bother. Those familiar with Knussen’s less overt reading may baulk at Slatkin’s full-blooded approach to this score. Trouble is, the Cleveland performance, nicely balanced and not without oomph when required, now seems a little reticent. Also, it feels much more like a concert piece, with nuance and fine detail aplenty, but it lacks Slatkin’s thrilling sense of theatre. Ultimately, though, both versions are very persuasive, so I’d urge you to hear both. Billy the Kid, premiered by the Caravan Ballet Company in 1938, has fared quite well on record. Leonard Bernstein and the composer himself loom large here, their recordings of the complete score essential listening (CBS-Sony). At first glimpse, Slatkin’s prairie is a broad, daunting space, the wagons’ progress steady and stoic. As for the tall skies and wide horizons, they’re powerfully evoked in playing of considerable weight and clarity. This is Copland in 70mm, with a sound to match. Even more welcome is the conductor’s deft handling of those popular tunes and cowboy songs, which emerge with a freshness and bounce that’s impossible to resist. Street in a frontier town is particularly well shaped and paced, these doughty Detroiters responding with commendable zest throughout. Indeed, I’m constantly reminded of what a fine band this is, and how, in this repertoire at least, they blow their rivals into the proverbial weeds. Mexican dance and finale is meltingly done, the bass drum muscular without being steroidal. What’s more, there’s real feeling here, Copland’s gentler musings articulated with a simplicity and openness that’s unusually moving at times. Slatkin’s easeful, unaffected approach to this music also extends to the big set-pieces, such as the gun battle and Billy’s arrest, where Alspaugh’s engineering never becomes self-consciously hi-fi. In short, everything about this performance and recording is utterly musical, that pliant little desert waltz a case in point. To cap it all, The open prairie again, that frontier spirit more indomitable than ever, makes for a truly stirring sign-off. At the start of this review I said Slatkin is doing good things in Detroit. Strike that, he’s doing great things there, as this unmissable coupling so triumphantly testifies. Such are the musical and technical virtues on display here that I’m sorely tempted to make Slatkin’s Billy the Kid my top choice. At the very least, this performance belongs up there with those of Copland, Bernstein and Litton, with more goodies still to come. Can’t wait! An already promising cycle just got a whole lot better; super sonics from Soundmirror, too.